CASTLE POINT MP Rebecca Harris has called for a review of Health and Safety laws relating to Canvey’s paddling pool. Lord Young was yesterday appointed by the Prime Minister to review the operation of all health and safety legislation. Rebecca has also been busy this week, teaming-up with ITV’s This Morning celebrity GP, Dr Chris Steele MBE, to support this year’s Carers Week and celebrating the contribution made by people in Castle Point, and throughout the UK, who provide unpaid care for someone who is ill, frail or disabled. Last week, Rebecca was one of the twenty MPs who won the right, by ballot, to present a Private Member’s Bill to the house. Where Do You Stand On This Week’s Town Council Issues? FIRST exposed on this Blog in April, Canvey island Town Council’s political agenda and financial competence have come under scrutiny this week. Residents have been shocked to find that the vast majority of Town Council (TC) spending has not been safeguarded by formal contracts – and dismayed to learn that the contributions they make to the TC may need to rise by as much as eighty-four percent, next year, if the current shortfall of over £200,000 (between what the TC plans to spend, and what it receives) is to be avoided. In a letter to this Blog, Bill Sharp proposed a radical solution to the Town council’s imminent demise and invited reader opinion; but where do you stand on the issues? Do you believe that the Town Council should be disbanded? Or do you believe it should be retained? 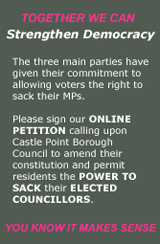 Do you agree with the TC’s agenda of taking-over control of island assets from Castle Point Borough Council (CPBC)? Or do you believe the TC should plough its precept back into the community to address the island’s poverty and deprivation issues? 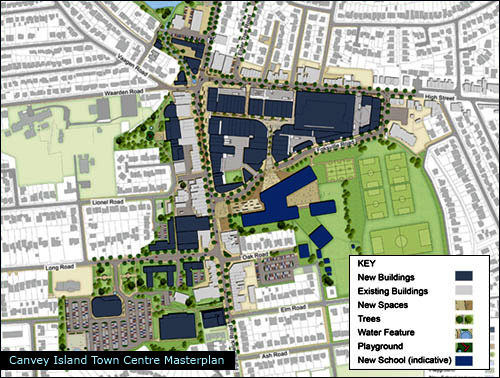 Do you believe that Canvey Island is a special case, deserving of additional CPBC funds, over and above those amounts spent on our mainland neighbours? Or do you think Castle Point should try to distribute its resources evenly throughout the Borough? 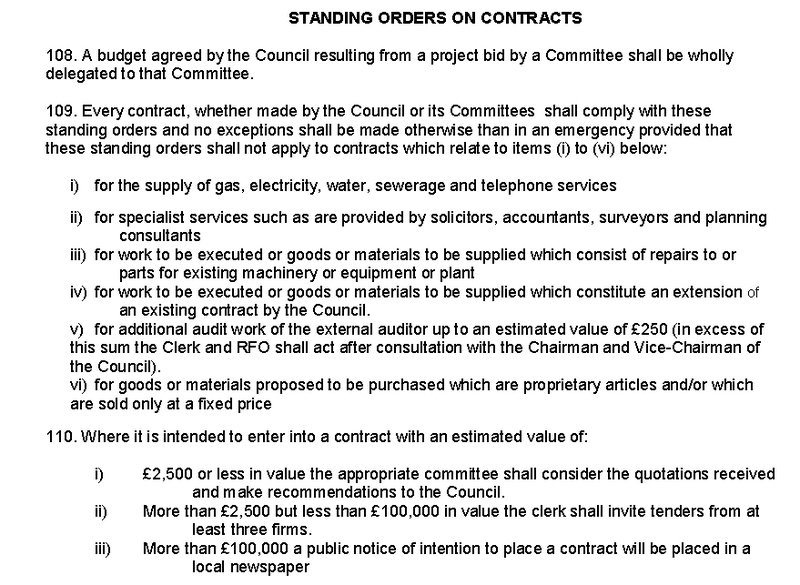 If Canvey Island Town Council is to be disbanded, another petition will probably need to be raised. Is that what you want? Or are you prepared to trust that Democracy will provide its own solution to the problem in next year’s Town Council elections? These are fundamental questions that need answering by islanders. Huge cuts are on their way as the Coalition Government reigns back on its public spending; and benefits, upon which many islanders rely, are to be reassessed. Local charities will come under increasing pressure for their scarce resources, while the majority of islanders will be unable to continue providing them financial support. Bleak times are ahead. Can we still afford the luxury of a Town Council pursuing its own political agenda? Or can we rely on electing a new swathe of councillors who will work with local businesses, charities and church leaders to mitigate the harm that inevitable spending cuts will have upon the island’s vulnerable? Filed under: Island focus | Tagged: Straw poll |	Comments Off on Where Do You Stand On This Week’s Town Council Issues? YESTERDAY’S REVELATIONS regarding the Town Council’s finances exposes the myth behind the Canvey Island Independent Party’s slogan, ‘Canvey for Canvey.’ If residents want to separate Canvey Island from Castle Point: it is going to cost them – big time. With Bob Spink temporarily removed from the local picture, this week’s Echo coverage was the first, since this Blog’s inception, not to include any reports about protests on Canvey. Despite angling their Castle Point stories from protester viewpoints, the paper’s coverage has only been of Borough Councillors quietly getting on with the job of debating local matters and implementing their promises under the public’s eye. Nothing has changed in the Council chamber – residents have just not been confronted with Spink and Dave Blackwell posing for the Echo’s cameras and dispensing their stream of lies. Dave Blackwell, it seems – despite being an avid reader of this Blog – is back in hiding. When questions are raised here, he chooses not to answer – just as his party chooses not to be open about its separatist aims, or to be truthful about how much those ambitions would cost. But readers now know why the CIIP led Town Council has failed to publish an Annual Report on its Website since its first year in 2007/08 – to have done so would have revealed the extent to which pursuing un-costed policies have led to a pumped-up Parish Council’s imminent insolvency. But Blackwell and the Town Council’s chairman, Nick Harvey, are not concerned with bankruptcy; because, unlike any private organisation, they can simply vote for islanders to contribute more. They know that, next year, they can simply tell the Borough Council to increase Canvey’s Town Council levy by 84% – and there is nothing that anyone can do about it. (If you refuse to pay: you will simply be pursued through the courts and face possible imprisonment). It is a win-win situation for the CIIP – and one from which they have chosen to spend some three-and-a-half percent of the TC’s precept (over a quarter-of-a-million pounds) on their own remuneration. At the moment, the Town Council provides no services – they are all provided by CPBC – but it is clear that the TC has that ambition. Furthermore, it is becoming frighteningly clear that neither the CIIP, nor the Town Council, have any idea of how much their ambitions will cost.